Looking to get more fish in your diet? 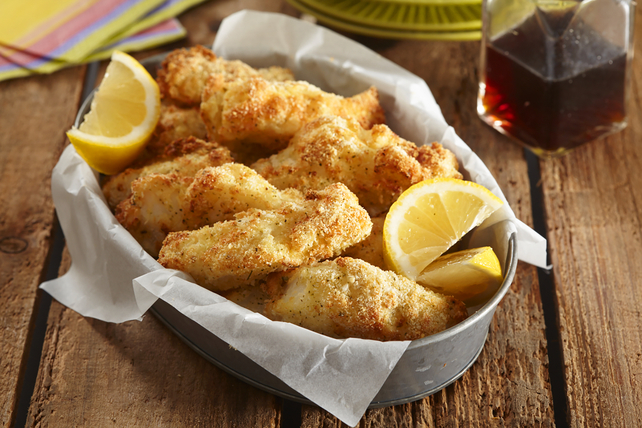 Coat these Air-Fryer Fish Sticks with panko bread crumbs and Parmesan cheese for a tasty twist on frozen fish sticks. Heat air fryer to 390°F. Whisk eggs and Miracle Whip in pie plate until blended. Use pulsing action of food processor to process bread crumbs and cheese until bread crumbs are finely crushed and mixture is well blended; pour into separate pie plate. Add fish, 1 stick at a time, to egg mixture; let excess egg mixture drip off, then dip fish stick into bread crumb mixture, turning to lightly coat both sides of stick with crumb mixture. Spray air fryer basket with cooking spray. Place about 1/3 of the fish sticks in single layer in prepared basket; add to air fryer. Cook 12 min. or until fish flakes easily with fork. Transfer fish sticks to plate. Repeat, in 2 batches, with remaining fish sticks. If you don't have a food processor, you can instead crush the panko bread crumbs by hand. Place crumbs in a resealable plastic bag. Seal bag, then finely crush the crumbs with a mallet or rolling pin. Mix with cheese, then use as directed. Try these other air-fryer recipes: Air-Fryer Boneless Buffalo Chicken and Air-Fryer Chicken Nuggets.